The 1 Jan. 1889 issue of La Revista de Ajedrez mistakenly gives the date as Mar. 1886 (instead of 1887). The Columbia Chess Chronicle of 17 Jan. 1889 gives this result (+5-2=2 for Mackenzie) dated to May 1887 and the result of an other match between Mackenzie and Golmayo in Mar. 1887 with score +5-1 for Mackenzie. This seems to be a confusion with the Mackenzie-Vazquez match in Mar. 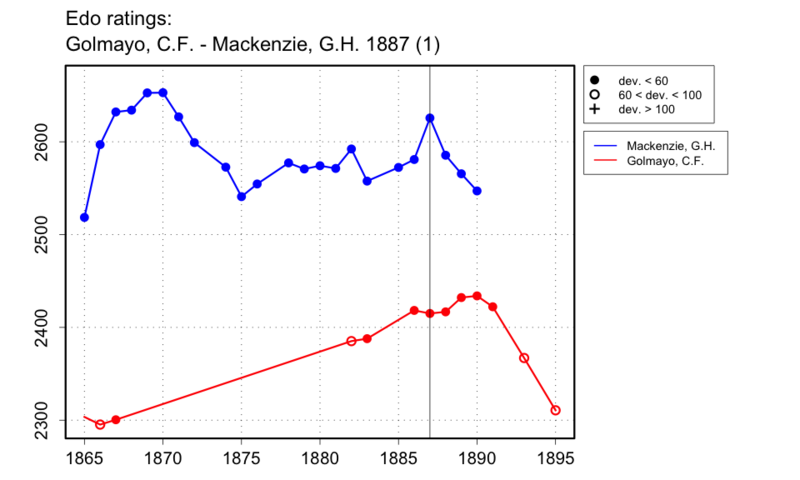 1887, with score +5-1 for Mackenzie.